You are probably sick of posts about homemade pajama pants using this easy tutorial, but I couldn't resist another. Previous 15 minute jammy pants can be found here & here. We had wonderful family friends visit on their way to and from the beach (one of the benefits of living in Charlotte - lots of beach traffic company!). I didn't get five pairs of pajamas whipped out in time for their first visit two weeks ago, but I was determined to have five pairs (my 2 boys, her 3year old and 1 year old twins) on their return. That was a lot of ironing folds in fabric for elastic casings and hems, but I powered through and got it finished. It was tough to get five toddlers to look at the camera right before bedtime. I almost forgot to do the photo-shoot. I had plans for doing it outside, but the kids were DONE by this point, so it was all I could manage. 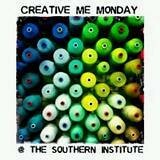 I'm linking up today at Southern Institute. Oh, and I have been too busy with etsy orders to do much work on Across the Seas Quilt-a-long, Farmer's Wife Quilt-a-long, my fall patchwork quilt or much of anything else! I'm hoping to get back on track this week. Of course they were all snuggled up until I grabbed the camera.